A major cross-border dairy business has turned in record profits. 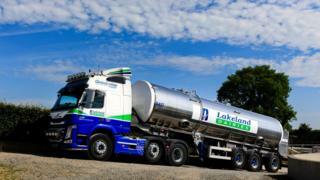 Lakeland Dairies, which has processing facilities on both sides of the border, reported an operating profit of £15.8m on group revenues of £733m. It said investments in technology and automation had paid off. The company recently completed a merger with another cross-border dairy business LacPatrick, which will make Lakeland the second biggest dairy processor on the island of Ireland. It will process a cross-border milk pool of 1.8bn litres from 3,200 farms in 16 counties. The company said market conditions in 2019 would depend on the outcome of Brexit and demand for its range of dairy produce. In an interview with BBC News NI earlier in March, the firm's chief executive Michael Hanley said Brexit would mean extra costs and build inefficiency into the business which could hit profitability. The firm has operations in Newtownards and Banbridge. The LacPatrick merger will bring it processing capacity in Coleraine and Artigarvan.